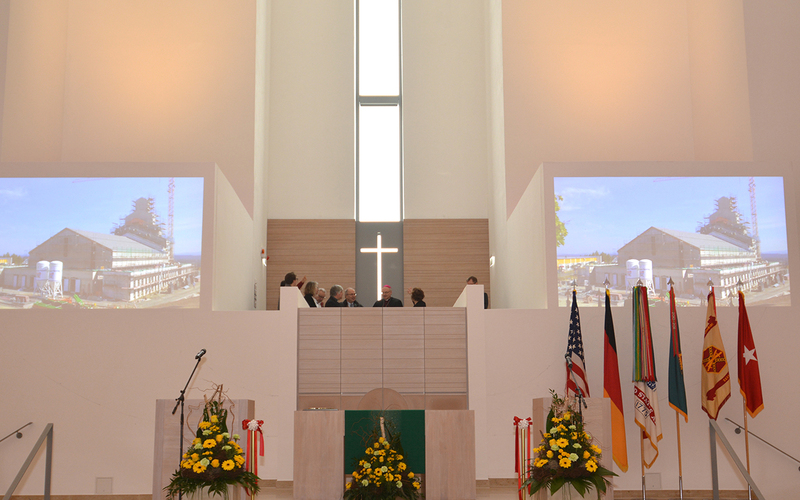 GRAFENWOEHR, Germany — Chaplains are one the Army’s greatest assets, providing vital moral leadership and one-on-one counseling with confidentiality. A week before I left the U.S. bound on a flight to Europe, I was stopped at a red light behind a late model sedan with a very unique message placed on the bumper. It was a message to coexist. As I read it I thought of a group proudly represented in the United States Military, more specifically the time honored Chaplain Corps. Although other venues have chaplains to lead them morally, the military chaplain is unique. There are hospital chaplains, prison chaplains and other types specific to an organizational location, but military chaplains are warriors in more than one sense of the word. The Continental Congress established chaplains as an integral part of the Army of the United States on July 29, 1775. Almost unchanged from its inception to today, there are men and women of all faiths, who often work in challenging environments all over the world. They provide a valued service to our troops. Chaplains frequently deploy into harms’ way, and continue to faithfully counsel our Soldiers, Sailors, Airmen and Marines. They give thoughtful direction to military members who experience stress from combat, family separation and social hardships. “Pastoral care and counseling is an essential capability of the Chaplain Corps, a key part of nurturing the living,” Hall said. The hometown pastor or priest may attend to critical situations and crisis from time to time. For the Army Chaplain, this is the primary mission. Countless times before, military chaplains of all faiths have been among the mortally wounded. As a military chaplain, the theater of operation is vast and is often one of crisis intervention and hazard-filled days. “As a religious leader, the Army requires the capability to perform or provide religious support across extended distances, which accommodates the Soldier’s right to the free exercise of religion and supports resiliency efforts to sustain Soldiers in combat,” said Hall. While the military chaplains’ main focus is to minister to military personnel, they find themselves also tending to the families and civilians working for the military. These duties include a whole host of areas from anger management and marriage enrichment to troops transitioning to and from combat operations. In some venues, chaplains serve diverse constituencies. This is the true meaning of coexistence. The military supports the presence of a wide range of denominational and non-denominational ministries. The military model reflects upon all faiths and spiritual traditions. “Chaplains deliver religious support through two required capabilities: provide and advise. Within the two required capabilities, chaplains and chaplain assistants fulfill three basic core competencies: nurture the living, care for the wounded and honor the dead. These three competencies provide the fundamental focus and direction as the chaplaincy executes its mission of ensuring the free exercise of religion for Soldiers,” said Hall. They have no mandate to convert or attempt to convert someone from one religion, belief or opinion to another chosen faith or belief. Chaplains are also bound and required not to disclose their confidential conversations. “Chaplains may not disclose a confidential communication revealed in the practice of their ministry without the individual person’s informed consent … a chaplain is bound by the requirements of sacramental confession,” said Hall. The chaplain balances these requirements and maintains’ all other military standards. We are fortunate to have these selected few preside in our military to to provide moral leadership, counsel and confidentiality. For more information about the Chaplain Corps, visit goarmy.com/chaplain or www.bavaria.army.mil/chaplain/.